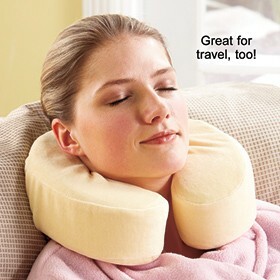 The Antibacterial Memory Foam Neck Pillow is ideal for allergy sufferers! This soft foam pillow has been treated with Ultra-Fresh® antimicrobial treatment to effectively control common household allergens such as dust mites, odor-causing bacteria, mold and mildew. The memory foam conforms to your head and neck to give you a restful sleep at home or while traveling. Measures 11-1/2" x 11" x 3".